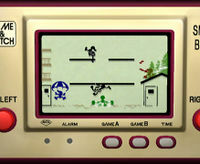 Flat Zone is Mr. Game & Watch's home stage. A home stage is a stage or set of stages associated with a character by certain game modes. 7 Hypothesis of "home advantage"
Characters' home stages are normally from the same universe as the character. However, in all the Super Smash Bros. games there are playable characters who do not have a stage belonging to their universe; such characters are instead assigned a home stage from another universe. In Super Smash Bros., a character's home stage is the stage on which they are fought in 1P Game. Each of the eight starter characters has their own home stage, while the four unlockable characters share stages with starter characters. All starter characters and two of the unlockable characters have home stages from their own universes; the other two unlockable characters, Captain Falcon and Ness, have home stages (Planet Zebes and Dream Land) from different universes as they are fought there in their unlocking battles, due to there being no stages from their own universes (F-Zero and EarthBound, respectively). Mushroom Kingdom, a stage from the Mario universe, is not the home stage of any character. In Super Smash Bros. Melee, characters have different home stages in different game modes. All characters have a home stage for All-Star Mode, most have one or two home stages for Classic Mode, and unlockable characters have a stage for their unlock challenge fight. All universes with playable characters have at least one stage, except Fire Emblem. However, even for characters that have a stage from the same universe, in some game modes they will use a stage from a different universe as their home stage. In All-Star Mode, every stage serves as the home stage for at least one character, except Past Stages and Big Blue. This results in several characters (Bowser, Ganondorf, Young Link, Mewtwo, and Pichu), in addition to the Fire Emblem characters, having their All-Star home stage be from a different universe. In Classic Mode, in addition to the Fire Emblem characters, Bowser and Mewtwo each have a stage from a different universe as one of their home stages. In character unlock challenges, in addition to the Fire Emblem characters, Ganondorf, Falco, and Mewtwo have a stage from a different universe as their home stage. In Super Smash Bros. Brawl, home stages are used in Classic Mode and All-Star Mode. Each character can have multiple home stages. All characters' home stages are all of the Brawl stages from their own universe (Melee stages are not used as home stages), with the exception of R.O.B. and the stage Mario Bros. There are no stages from R.O.B. 's universe, so he instead has Mario Bros. as his home stage (and it is not available as a home stage for the Mario universe). ↑ R.O.B. 's home stage is Delfino Plaza in Classic Mode and All-Star Mode when Mario Bros. is not unlocked. In Super Smash Bros. for Nintendo 3DS, home stages are used in Classic Mode. Each character can have multiple home stages. Unlike in previous games, Past Stages also serve as home stages. All characters' home stages are all of the stages from their own universe, unless there are no stages from their own universe. Characters from universes without stages have all of the stages whose universes lack characters as their home stages. The Mii Fighters' home stage is considered to be Battlefield, as they are part of the Super Smash Bros. universe and are only fought in Classic Mode as enemy teams. ↑ This stage was added as a free stage in the 1.1.1 update. When playing an older version, the "miscellaneous" stages used by R.O.B. and Wii Fit Trainer are used instead. When trying to unlock Duck Hunt, they will be fought on Battlefield regardless of which version of the game is being played. ↑ As R.O.B. doesn't have a stage from his own universe, Wrecking Crew is considered to be his home stage as he is fought here in his unlocking battle. In Super Smash Bros. Ultimate, home stages are treated the same as they are in Smash 4. ↑ While Incineroar is fought on Pokémon stages in Classic Mode, its unlock battle takes place on Boxing Ring. ↑ While Ryu and Ken are fought on Suzaku Castle in Classic Mode, their unlock battles take place on Battlefield and Boxing Ring respectively. There is no clear or consistent benefit to a character fighting on their "home stage." Any advantages that certain characters have over others on stages happen across the entire stage list and are situational; they are not affected by the universes in which the characters originate from (for example, Fox and Pikachu dominate on Temple, even though they do not originate from the Zelda universe). In some cases, it may be to a character's disadvantage to be fighting on their home stage; for example, Ness is unable to use his recovery move when knocked between buildings in Fourside. Additionally, Final Destination, which acts as the home stage for Roy, is disadvantageous for him against nearly every character (except for arguably Fox and Falco) as he is much more vulnerable to combos without any platforms to escape to. In Brawl, the ledges of the Lylat Cruise stage are thinner than most other stages, causing Fox, Falco, and most notably Wolf to curve underneath the stage more frequently when using their respective recovery moves instead of directly grabbing the edge. Additionally, in Skyworld, Pit's Centurions in his Final Smash will crash into the breakable platforms when they aim for opponents, quickly destroying the stage and temporarily removing all ledges; this consequently removes Pit's ability to plank and makes him much easier to gimp. However, in contrast, some stages do offer advantages to some characters; as mentioned before, any such advantages are non-circumstantial, but these certain stages may have been the origination for the "home advantage" hypothesis. In Melee, Fountain of Dreams serves as Marth's home stage, and is frequently cited as one of his best stages in the entire game, even at high-level tournament play. The stage's small size allows him to control space more efficiently, and the extended bottom blast line allows him more room to recover with Dolphin Slash, which travels purely vertically. In Brawl, on Bridge of Eldin, Zelda and Sheik's Light Arrow, Ganondorf's Beast Ganon, and Toon Link and Link's Triforce Slash are much easier to use, and harder to dodge; the frequent absence of a lower blast-line also acts as a benefit to Link, Ganondorf, and Sheik, who normally have relatively poor recoveries. The low blastline of Shadow Moses Island acts as a benefit to Snake, as most of his attacks (especially his special moves) have mostly upward knockback; his high weight and falling speed make him more resistant to vertical KOs, so he is not as affected. On other stages, characters can receive neither a clear advantage nor disadvantage. On Summit, for instance, all the characters slide around, except for the Ice Climbers, who experience no change in their friction when walking on the stage. Like other characters, however, they are still unable to grab onto the ledges in the stage; this trait causes Belay to more frequently cause Nana to be KO'd, thanks to Belay giving Popo more height than Nana when there is no ledge to tether to. Another example is Little Mac on Boxing Ring: the stage gives no access to the bottom blast line, which remedies Mac's poor recovery, but also has plenty of verticality, making it difficult for him to traverse the stage. In Super Smash Bros. 4, the Ω form of Boxing Ring takes this even further in Mac's favor — while being based off of Final Destination means it has a lower blast line, the walls of the actual stage reach all the way down to it, allowing Mac to make full use of his uncharacteristically superb wall jump.